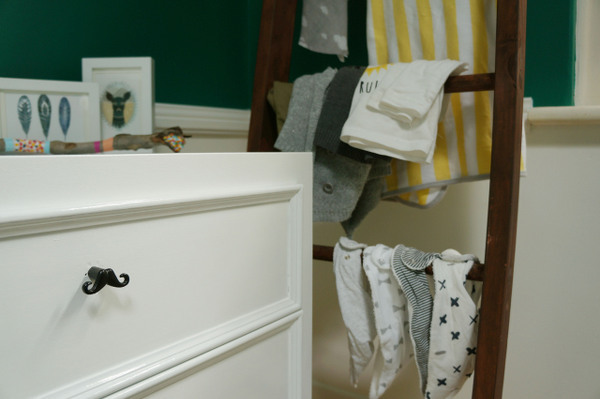 Here’s a nursery a little man can really grow into – and it belongs to lucky little boy Greyson. If you like something a bit unexpected in your nurseries, you’re going to want to come and have a look at this one. Greyson’s nursery all came together around a print that was a kind of homage to the year of the horse and my own childhood. From there it was really an elimination of the things I didn’t want. I didn’t want the colour blue as it was too obviously boyish, and I also didn’t want a neutral nursery. I guess I’m all about colour and having a room that can grow in personality as he does. I just found myself endlessly scrolling through Pinterest nursery boards to see what it was I liked and didn’t like. 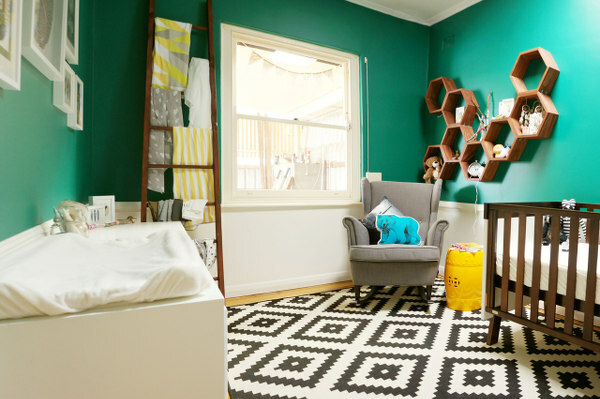 I didn’t want his room to look like a common nursery – I wanted something bright, fun and an area he could inject his own style and personality into. 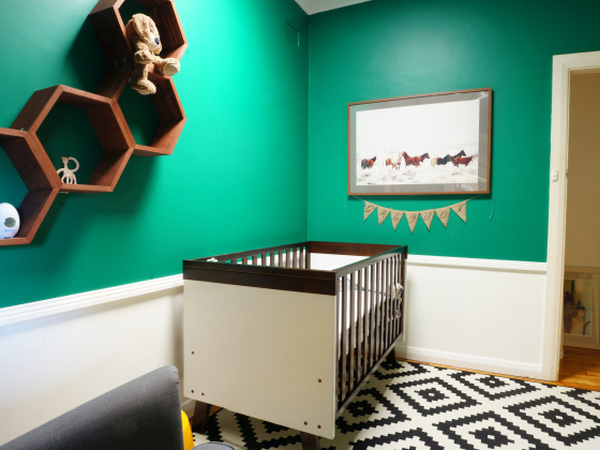 The room colour (Taubmans Bright Jade) and the horse picture were my starting points, and the main furniture items were easy to decide on, so the room came together relatively quickly but fairly late in my pregnancy. I had a few ideas of what I wanted but when I started looking at other nurseries on Pinterest I kind of got a little lost and bamboozled with styles, colours, items to include and working all this out with how big his room actually was (quite small)! So I created a mood board. There it was easier to visualise what his room would actually look like and how many items I could fit in. My husband came in pretty handy too! 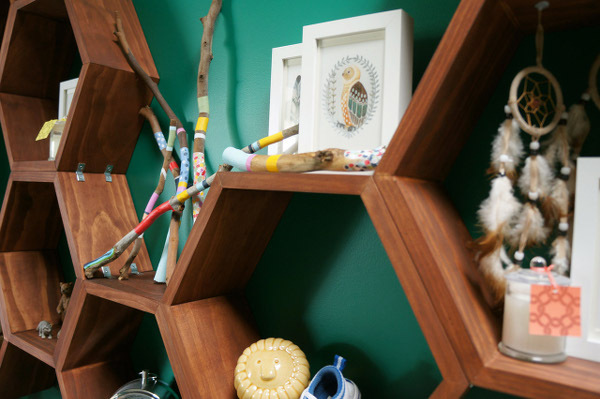 He built the ladder and the hexagon wall shelves for me – I couldn’t have even imagined how much they would have cost to buy and we were definitely working to a budget. I guess I kind of ended up with a modern earthy/Aztec style room but honestly I still don’t really know how to describe his room style! I do know that when he’s a little older I want to add a teepee reading corner and buy him an Native American Indian headdress – I just can’t help myself! I love kids’ rooms. 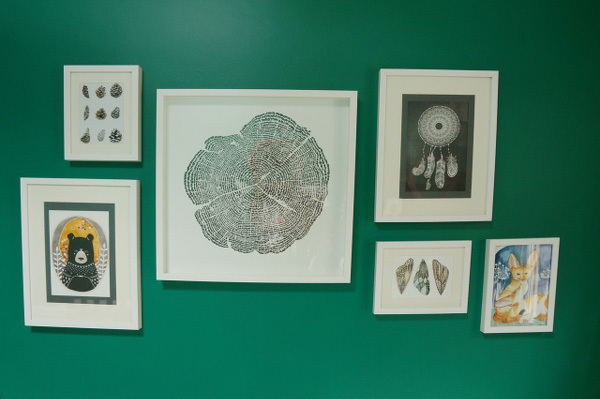 Framed gift cards – River Luna via Studio Oh! Well done, Hayley! What a lucky little boy Greyson is to gaze on this scene every day.